With less than 24 hours to go, security precautions for Apple’s big press event Tuesday have been taken to unprecedented levels. In addition, Apple security personnel are carefully scrutinizing the phones for unauthorized pictures or messages, looking for any attempts to communicate details of the event to the outside. Apple has a reputation for being one of the most secretive organizations in the world. Security for Apple’s events is always tight, but this time the precautions appear to be more elaborate than ever. The Flint Center’s 2,400-seat auditorium sits on the campus of De Anza College, a leafy community college in Cupertino, California, that’s not far from Apple headquarters. The company has revealed some of its most important devices in the theater, including the original Macintosh in 1984 and the first iMac, the machine that kick-started Apple’s comeback. This time, Apple seems to be going all-out on a big event that will likely see the introduction of two new iPhones and possibly a health/fitness device that could define a new category of wearable smartphone accessories. For the event, Apple has built a large, special-purpose building next to the Flint Center. Its purpose remains a mystery, but it’s likely for hands-on product demonstrations after the keynote, which will be livestreamed starting at 10 a.m. Tuesday. To keep the building’s purpose secret, Apple flew in a team of specialist contractors from the United Kingdom, the anonymous staffer said. The U.K. crew has been working on the building’s exterior for many days but have been kept from having any contact with anyone else working at the show. 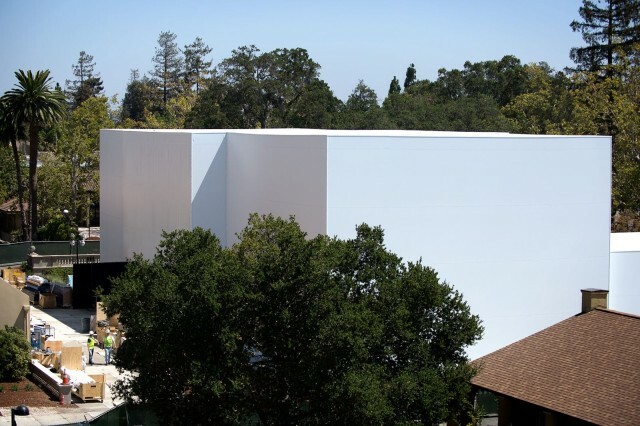 Apple conducted rehearsals of its event over the weekend, and the trial runs continue today. The anonymous staffer has not been allowed anywhere near the outside building, which is strictly off-limits to anyone without authorization. “We’re not allowed to wander around,” the staffer said. Indeed, everything is strictly quarantined. Everyone working at the show has been assigned strict roles and areas that they are allowed to access.